Day two in Glasgow was time-tabled like a military procedure; we had a lot to cram in and, although I knew it was physically impossible to do it all, there’s never any harm in trying. After a quick breakfast, we headed across town to the Necropolis. What a cheery way to start the day. The cabbie clearly thought I’d lost the plot when I gave our destination and asked me to repeat myself several times. 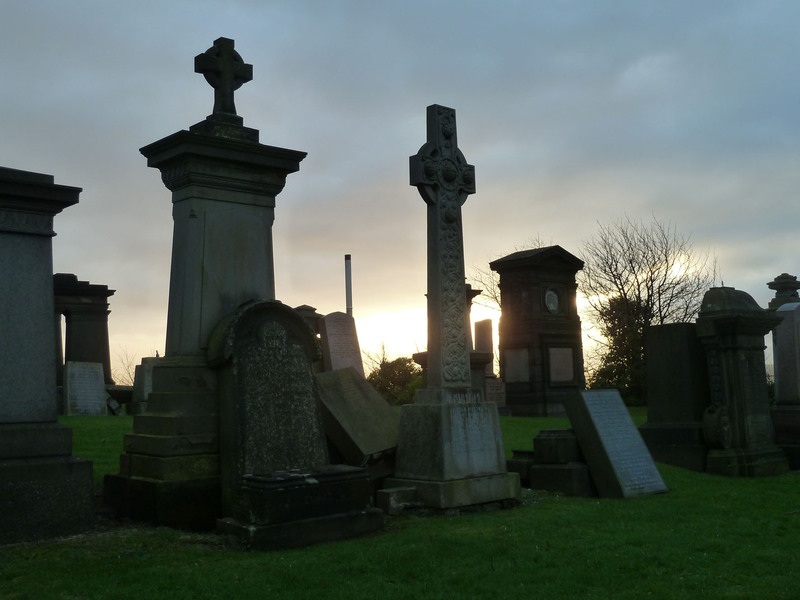 This cemetery is impressive and, as we explored the endless paths at sunrise (9am), the graves shimmered in the early morning light. The Necropolis is one of the most significant cemeteries in Europe, both in size and design. Built on a hill, it has a close relationship to the cathedral and a spectacular vantage point over the whole city. It was designed as a botanical and sculpture garden ‘to improve the morals and tastes of Glaswegians’ and act as a historical record and reminder of past greatness. The map at the entrance showed a web of tangled paths and, instead, I made my own way around, trudging up steep hills to get to the best and most beautiful stones. The 13th century Cathedral is mostly intact and, although it is an obviously dominating structure, it has an unobtrusive presence, with a calming atmosphere. 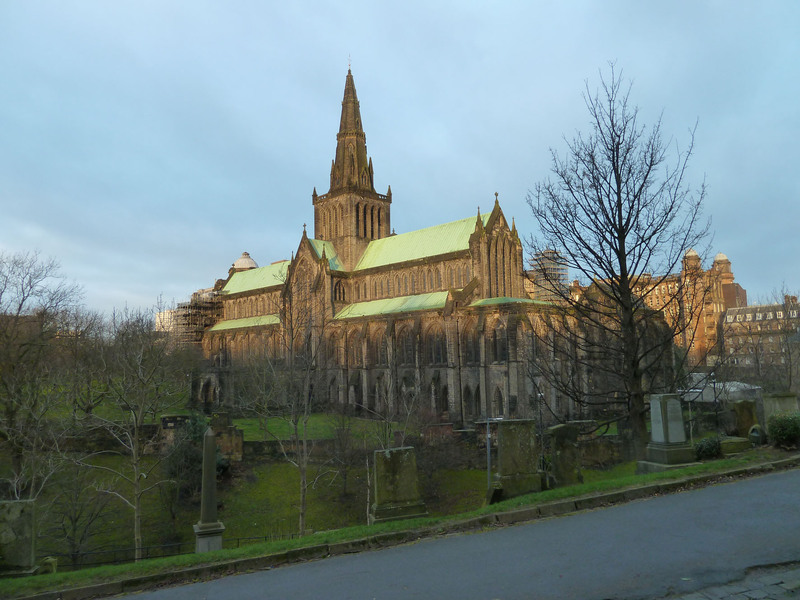 The lower church houses the tomb of St Mungo, Glasgow’s patron saint, who appears in visual imagery across the city. After all that walking, it was time for a rest and it seemed only appropriate to combine this with a cultural visit. 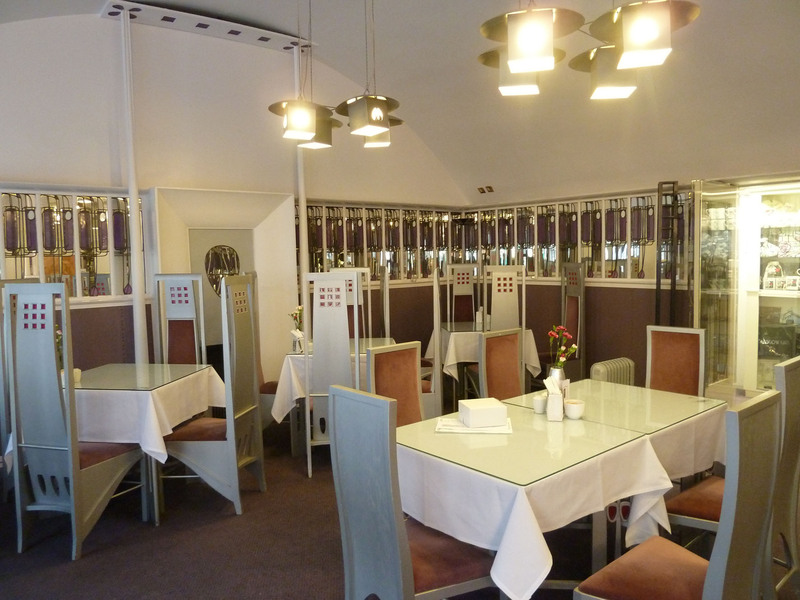 Willow Tea Rooms, was designed in 1904 by Charles Rennie Mackintosh. It was the only tea room building where he was given complete control over every aspect of the design, right down to the cutlery and uniforms. The building is located on Sauciehall Street, meaning alley of willows, and, although often abstracted, the willow imagery features in every aspect of the design. I enjoyed some hearty Scottish porridge while admiring Mackintosh’s attention to detail (sadly, they don’t still use his cutlery today). Upstairs, the Room de Luxe is the most magnificent part of the design and, when the tea room first opened, customers paid extra to use this room. The Room de Luxe, Willow Tea Rooms. Own photograph. 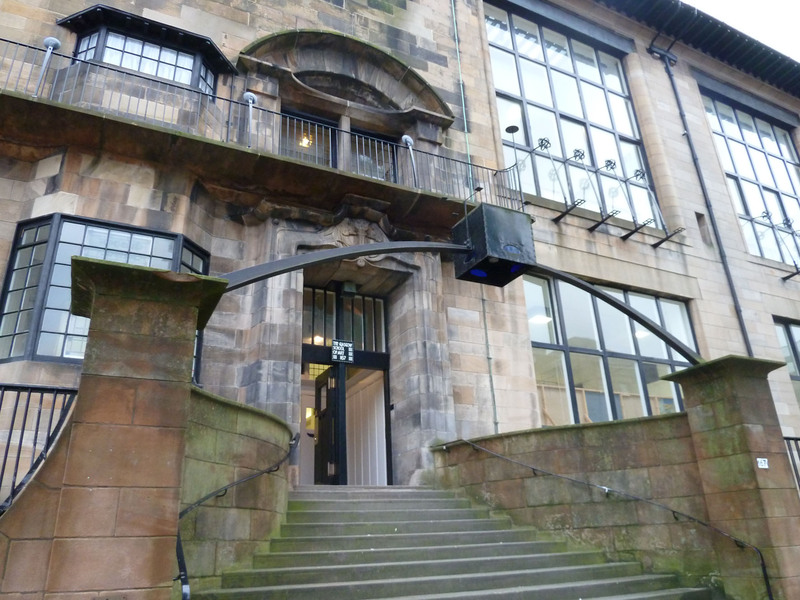 Just a stone’s throw away is the Glasgow School of Art where Mackintosh studied, graduating in 1893-4. In 1898, his designs (as part of the firm Honeyman & Keppie) were selected to use for the new GSA. 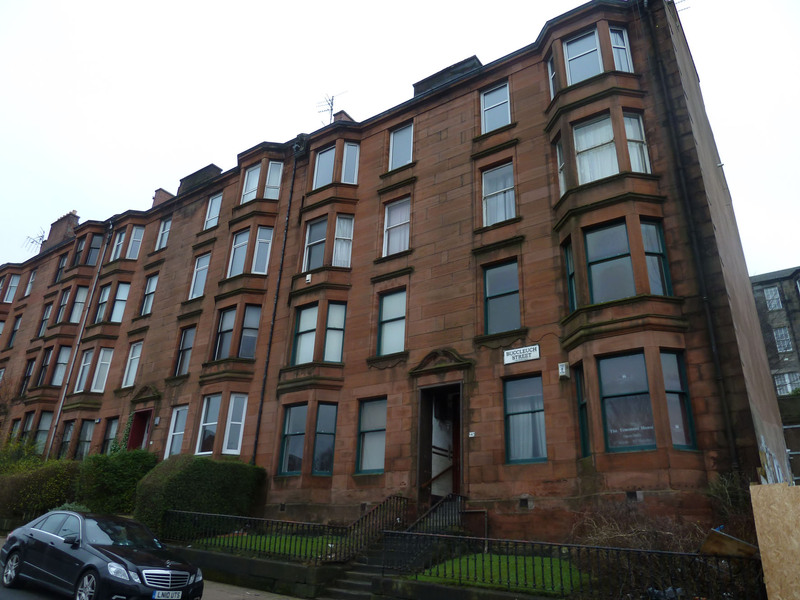 Built at the turn of the century, this remarkably modern building was at the forefront of new expression and a celebration of materials found in Glasgow. The incredible detail in this building cannot be underestimated; Mackintosh was a perfectionist and, for him, the unity of design completed a project properly. He designed buildings as a whole and, although fire regulations have necessitated the insertion of interior doors, this space was intended to flow uninterruptedly leading people forwards. In this same vein of movement, Mackintosh controlled the light throughout the building; the corridors were dark, encouraging people to their studios which were filled with natural light from vast windows. 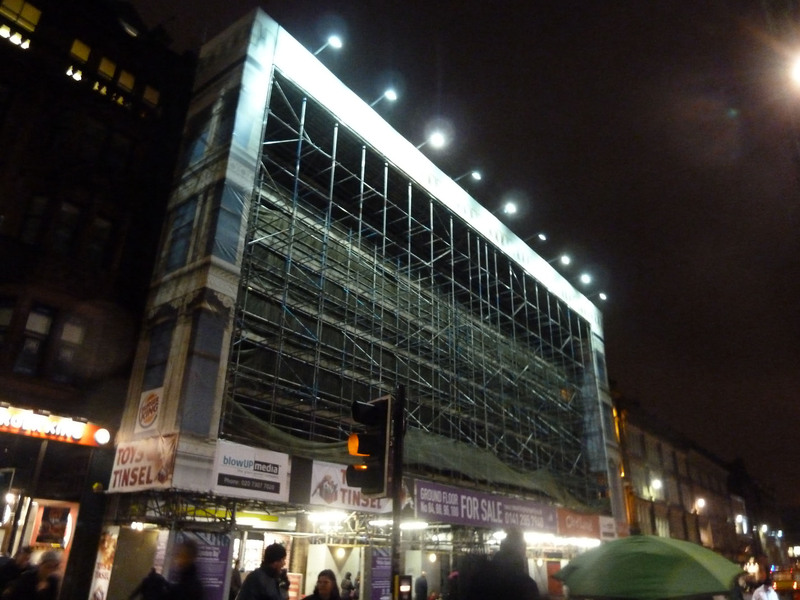 This was the second public building in Glasgow to have electricity, helping to extend working hours. In order to help students be in the right place at the right time, there are clocks across the whole building, ensuring that tardiness was never an option. 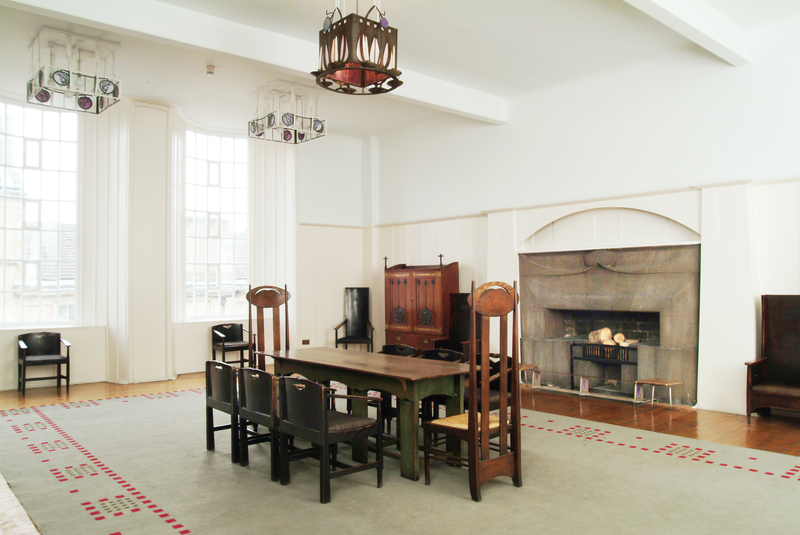 The Mackintosh Room. Image courtesy of Eric Thorburn and via www.gsa.ac.uk. 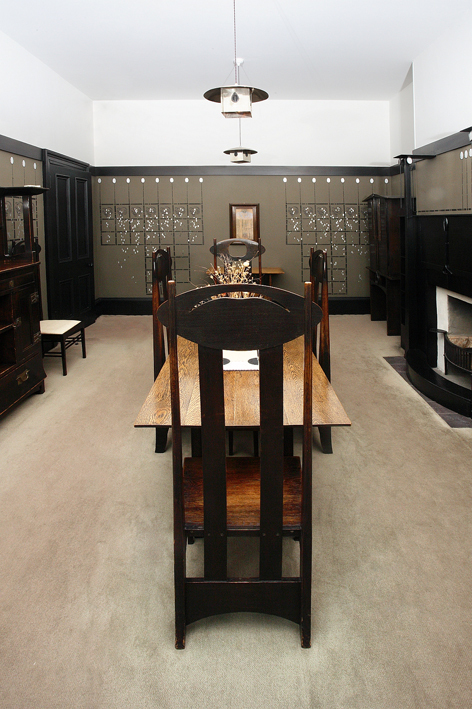 Mackintosh’s gorgeous library at the GSA is described as the masterpiece within the masterwork. It is a realm of architecture unparalleled, except maybe by Soane. The space is ingenious, intended to be quiet and sombre, conducive to study. Formed from three connecting spaces, although only two are immediately apparent, the height of the library is the same as that of the main studios. Now, absurdly, only the librarian and archivist are allowed upstairs as the library corridor is 1.1m wide rather than 1.2m which means it is officially unusable (health and safety rears its head again). There does appear to have been some dubious conservation in this space, with the wood upstairs being restored in a darker stain and some of the library furniture being handled less than tenderly, but it is incredible all the same. Detail of the Mackintosh Library. Image courtesy of Eric Thorburn and via www.gsa.ac.uk. Amazingly, the GSA is still a working space, used as Mackintosh intended it to be and tours are run twice daily by students of the art school. We went on a tour led by Maya, a 4th year interior design student, who certainly knew her stuff. It was lovely to hear about the building from the perspective of somebody who is lucky enough to use it on a daily basis. The Glasgow School of Art. Own photograph. 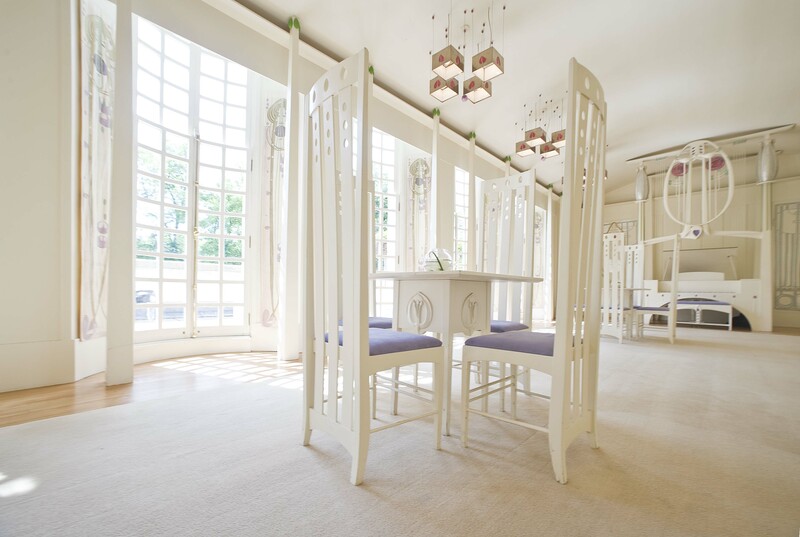 The GSA holds over 200 pieces of Mackintosh furniture and the final room covered by the tour is the furniture gallery, a room of wonderful Mackintosh chairs. One, a curved lattice-backed chair from 1904, is from the Willow Tea Rooms where it acted as a semi-transparent divider between the front and back salons on the ground floor. Used by the supervisor, the chair has a secret compartment under its seat for the takings, meaning that she was effectively sitting on her assets. Unifying the design scheme, the chair casts a shadow of a willow onto the floor. 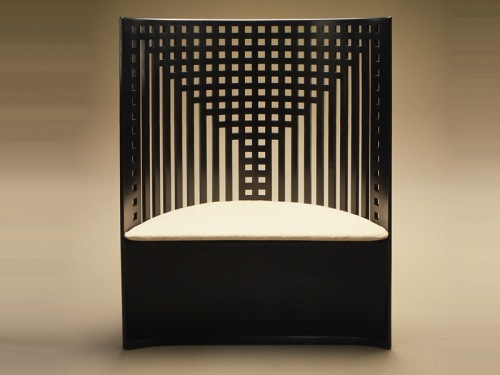 Charles Rennie Mackintosh, Willow Chair, 1904. Image via http://upstagedbydesign.com. We took a quick stroll around the nearby area to take in Tenement House (a typical Victorian building of 1892) which is currently closed to the public for winter, before hurrying off for lunch at Brian Maule. But, we didn’t have long as we had to be in time for the afternoon tour around the City Chambers. Now, this doesn’t sound that exciting as the building is home to the City Council but…wow! You wouldn’t even know you were still in Glasgow. This is a perfect example of Victorian civic architecture, designed by Glaswegian architect William Young, and an imposing symbol of the city’s political strength and historical wealth. Completed in 1888, it incorporates many styles: pillars of marble and granite lead to staircases of Carrera marble, freestone and alabaster (one is reputed to be the largest white Carrera marble staircase in the world); three sumptuously decorated rooms lead up to the magnificent banqueting hall which is 33.5 metres wide; and, as you come out of the minstrels’ gallery, a Wedgwood ceiling adorns a display of portraits of past Lord Provosts. 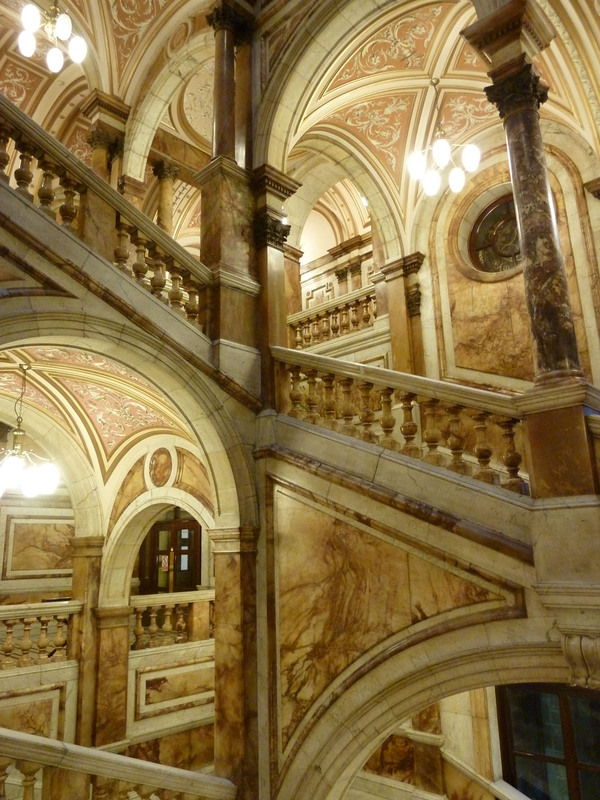 Staircase at City Chambers. Own photograph. This was the most unexpected place I visited in Glasgow and shows that you can’t judge a book by its cover. If you’re offered a tour of the Council then rush to it! And rush we did but this time to House for an Art Lover. 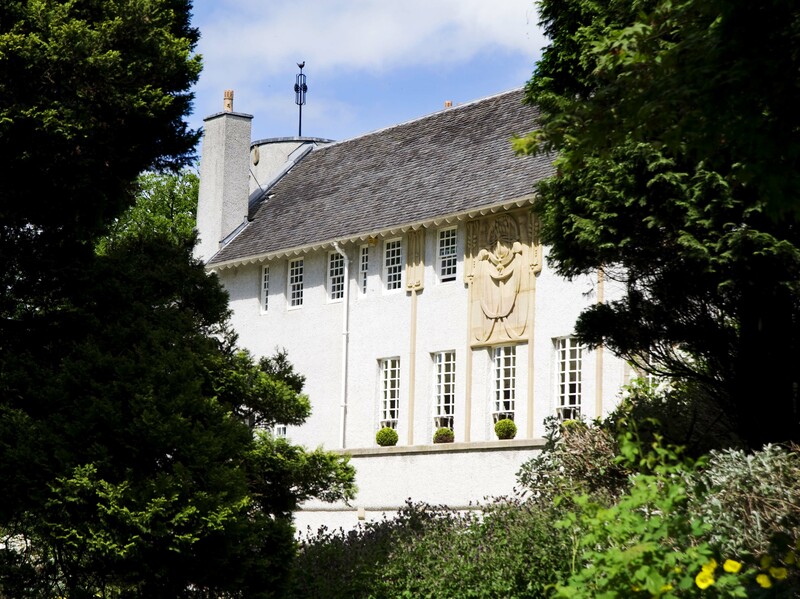 In 1901, Mackintosh entered a competition, set by a German magazine, to design a ‘House for an Art Lover’. 35 entrants submitted designs but Mackintosh was actually disqualified from the competition for not submitting the correct number of drawings. Still, his entry was awarded a special prize in recognition of his work that pushed the boundaries of architecture. House for an Art Lover. Image via www.houseforanartlover.co.uk. The vision of consultant engineer, Graham Roxburgh, led to Mackintosh’s ideas coming to fruition and over one hundred years after he first drew his designs, they now stand completed. Working with skilled professionals from the Glasgow School of Art, the team of architects had to turn 14 competition drawings into 500 working drawings to create the house. 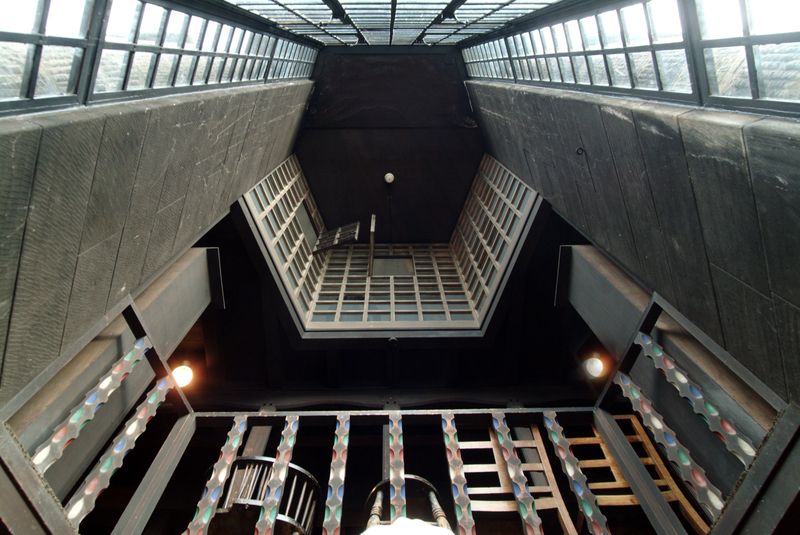 In the exhibition rooms, you can compare Mackintosh’s original designs with what actually stands today. Although some of his plans are remarkably detailed, he also left large areas unresolved which resulted in research into existing buildings to decide how to complete each section. 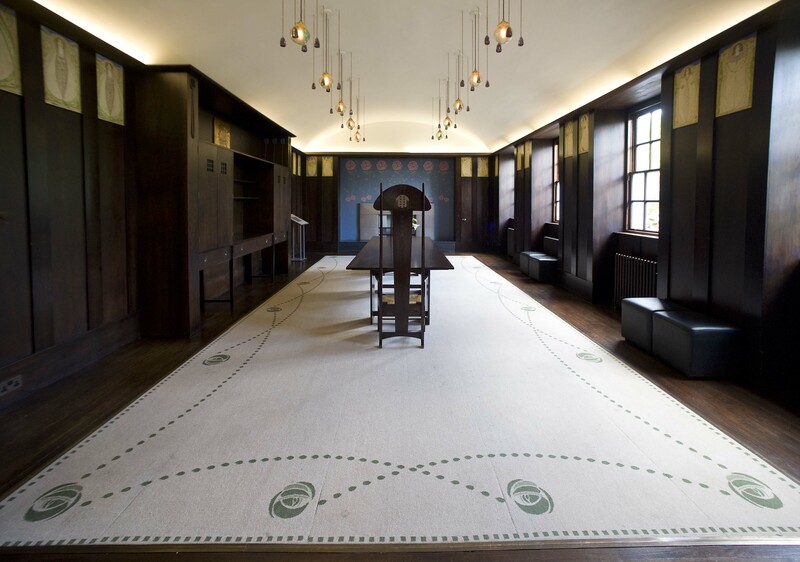 They have done a grand job and every detail has been considered; even the carpet has been split into sections according to what sizes would have been available to Mackintosh in the 19th century. Dining Room, House for an Art Lover. Image via www.houseforanartlover.co.uk. My favourite room has to be the music room. Contrasting the spacious and lofty main hall and intimate, darkened dining room, this is a bright long interior with dazzling white walls, flooded with natural light. The longest wall becomes a symphony of the imagination, the room a symbolic glade in a forest. We were lucky enough to have a private tour and soak up the space to ourselves. 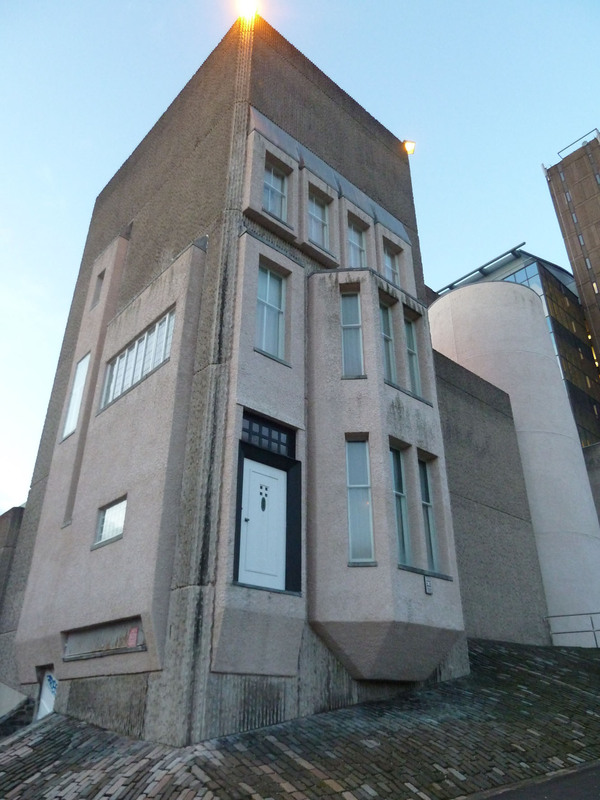 This is a house that never was, a house for an art lover, a house for a Mackintosh lover or a house for anyone who fancies a party and entertaining. 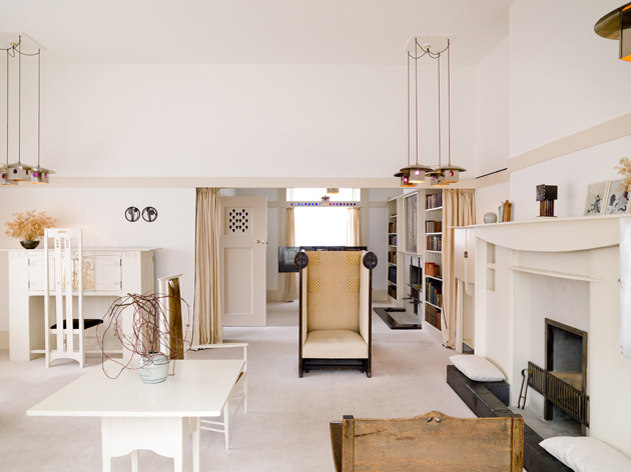 Mackintosh’s vision has been beautifully crafted and brought to life and the house is now used in very much the way he would have intended, showing the power of vision – both his and that of today’s craftsmen. Although quite compact, House for an Art Lover really gives you a feel for what Mackintosh was doing and was one of the highlights of our trip. Music Room, House for an Art Lover. Image via www.houseforanartlover.co.uk. Everything in Glasgow seems to shut at 5pm but I wasn’t content to call it a day so decided that, since it was pitch black and raining, it had to be the perfect time for a walking tour to take in a couple more Mackintosh buildings and the Egyptian Halls – sadly, the scaffolding prevented us from seeing this. Sometimes, even I know when enough is enough and as the rain got heavier, we gave in and headed to a cocktail bar next to GoMA where I could have a better look at all my new Mackintosh books (I didn’t think three was excessive at all) and re-energise for dinner at Ubiquitous Chip. The Egyptian Halls and its scaffolding. Own photograph. 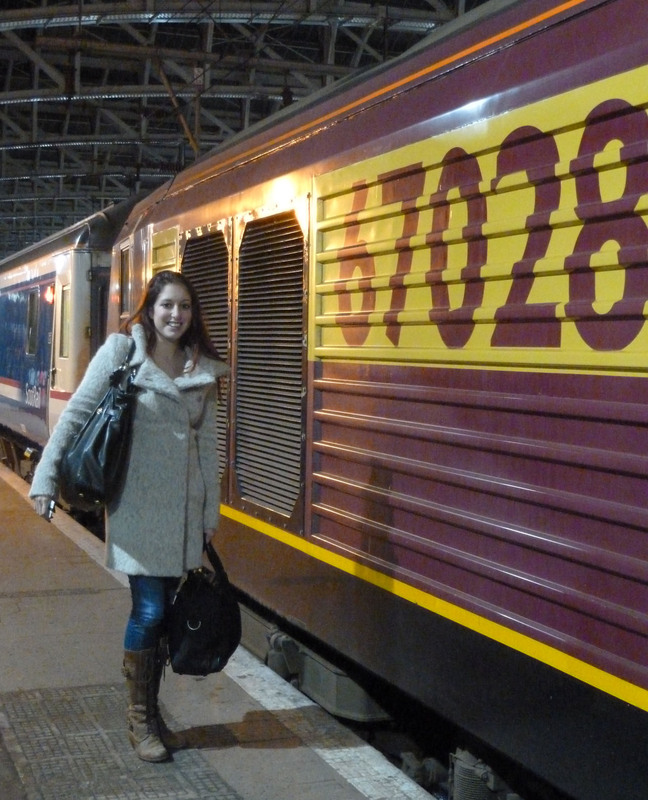 It was nearly midnight when the Caledonian Sleeper departed from Glasgow, heading back to London. What an exciting way to travel. All aboard! To see more of my pictures from the trip, visit www.facebook.com/chloenelkinconsulting. For information on all the buildings and galleries visited on day two see; www.glasgownecropolis.org, www.glasgowcathedral.org.uk, www.willowtearooms.co.uk, www.gsa.ac.uk, www.nts.org.uk/property/tenement-house, www.glasgow.gov.uk/en/YourCouncil/CityChambers/guidedtours.htm and www.houseforanartlover.co.uk. No journey of mine seems to be without a little drama and trying to get to Glasgow in early January in gale force winds should not be attempted by the fainthearted. When my alarm went off at 5.30am, I had a feeling this wouldn’t be my smoothest journey. Although Virgin Trains are great at replying on twitter, they’re not so good at communicating to those actually on their trains. We didn’t even manage to leave Euston before having to change trains – Train One was apparently defective and unfixable. Not a good start. Train Number Two abandoned us at Preston (a friend has since commented that just the thought of me stuck at Preston made him laugh) where due to re-platforming we were able to experience the delights of every station platform. I think they were trying to keep us warm by moving us around so frequently! Train Number Three, however, was a winner and, although late, nearly jeopardising my schedule, it delivered us safe and sound. 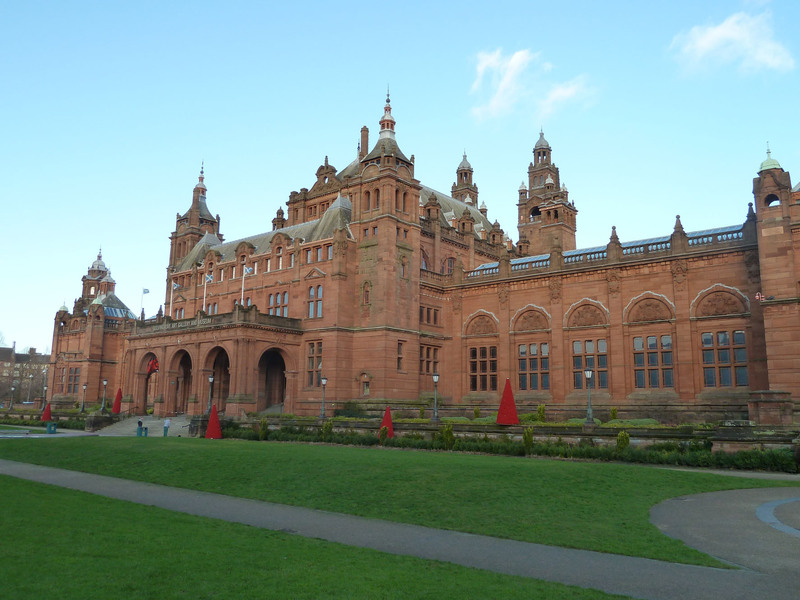 After a wonderful, oversized pizza at the Firebird, we headed to the Kelvingrove Art Gallery and Museum – the raison d’être for this whole trip. My learned companion is studying for an MA in Egyptology and her thesis focuses on Sekhmet statues. Rather ironically, the two here are on loan from the British Museum. After the academic necessities were completed, we went to explore the museum. There is no denying that Kelvingrove has an amazing and broad collection but the curation struck me as rather messy. The rooms are thematic though, often, without coherent logic; dead-ends confront you and, without rhyme or reason, random objects crop up at regular intervals. Kelvingrove is also very child-orientated in its forms of display; they clearly know their punters but this method often excludes a more mature audience. Kelvingrove Art Gallery and Museum. Own photograph. I was pleasantly surprised to come across Dalí’s Christ of St John of the Cross – a controversial painting from 1951. It is displayed alongside a remarkable ink study that was given, by the artist, to the then director of the Glasgow Art Gallery. 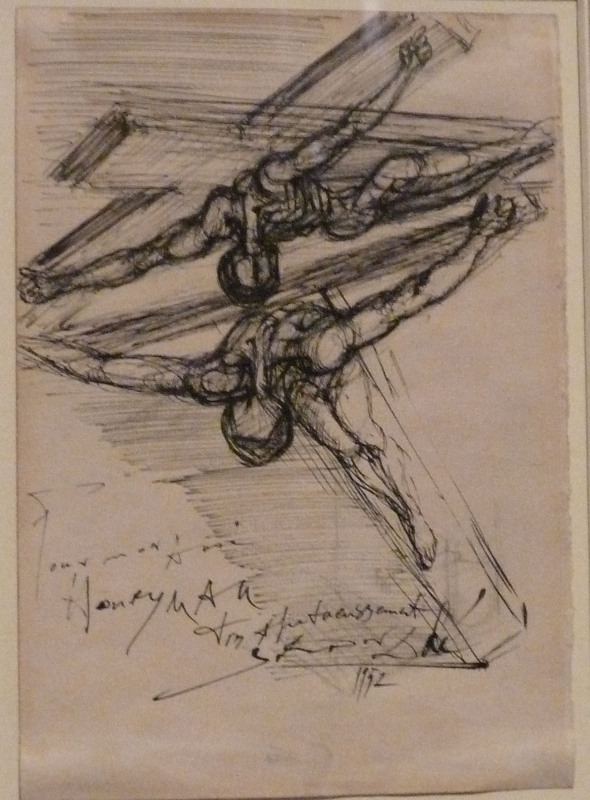 The drawing highlights Dalí’s daring in working towards the extreme angle of Christ’s body. Salvador Dalí, Study of Christ of St John of the Cross, 1952. Own photograph. The room of French art includes a Van Gogh alongside works by Pissarro, Seurat, Millet and Monet (I guess the room is looking at art painted in France rather than at French artists) but offers a more traditional gallery experience with a coherent layout and more structured feel. Following this is a room of Fragile Art – I didn’t know what to expect but it seems this is a rather strange term being coined for works on paper. There are some great things at Kelvingrove, if you have the patience to look, but the mess deterred us and, instead, we left and walked through the courtyards of the splendid University of Glasgow. 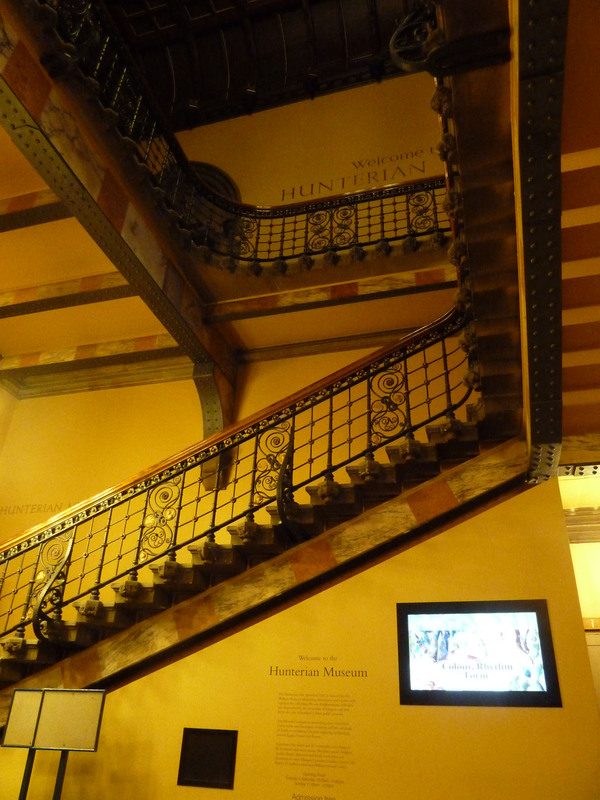 With only time to admire its architecture, we hurried past the Hunterian Museum – one of the leading university museums in the UK, showing the vast and varied private collection of its founder, Dr William Hunter (older brother to John who founded London’s Hunterian) – to Mackintosh House. The Hunterian Museum. Own photograph. Glasgow is famous for two Mackintoshes – the inventor of the waterproof raincoat, Charles Mackintosh, and the unrelated artist, designer and architect, Charles Rennie Mackintosh. Mackintosh House comprises the reassembled interiors of the house lived in by the Mackintoshes from 1906-14 (what was 6 Florentine Terrace, approximately 100 metres away). Although the house was demolished in the 1960s, the original features and designs were preserved and great pains have been taken to ensure the sequence of rooms exactly reflects its forerunner. Its recreation was no easy task and, although not everything about this house pretends to be accurate, the reproduction is as faithful as possible. It was decided not to replicate the sandstone façade of the original house and, instead, the key features (the front door and principal windows) are encased in rough cast concrete. Particularly striking is the studio-drawing room on the first floor. The geometry, unity and clarity of this L-shaped interior is stunning. Flooded with light, the rear section was, fittingly, used as a studio where each of the three walls was filled with a major object as its centrepiece – a gesso panel by his wife, Margaret Macdonald, a white bookcase and the dark-stained writing cabinet. This is more for display than practical use and it lacks much of the additional support required to act as a functional everyday object but there can be no debate about the beauty of its design. I would say this room was Mackintosh at his best but every time I see one of his works I am blown away and have a new favourite. To my mind, there can be no debate about the perfection of everything he did. The studio-drawing room at Mackintosh House. Image courtesy of The Hunterian, University of Glasgow 2012 and via www.glasgow.ac.uk/hunterian. The second floor was shut which meant we missed seeing the bedroom but we saw enough to be captivated and eager for the Mackintosh on day two of my itinerary. The dining room at Mackintosh House. Image courtesy of The Hunterian, University of Glasgow 2012 and via www.glasgow.ac.uk/hunterian. Mackintosh House is found within The Hunterian Art Gallery, the rest of which is also brilliant and made up for my disappointment at our first stop. As well as housing a small, superb collection of 18th century portraits (where I happily went back to my roots), two aspects particularly struck me. One focused on the art of the poster with works from the gallery’s print collection, focusing on posters as important social-historic documents. 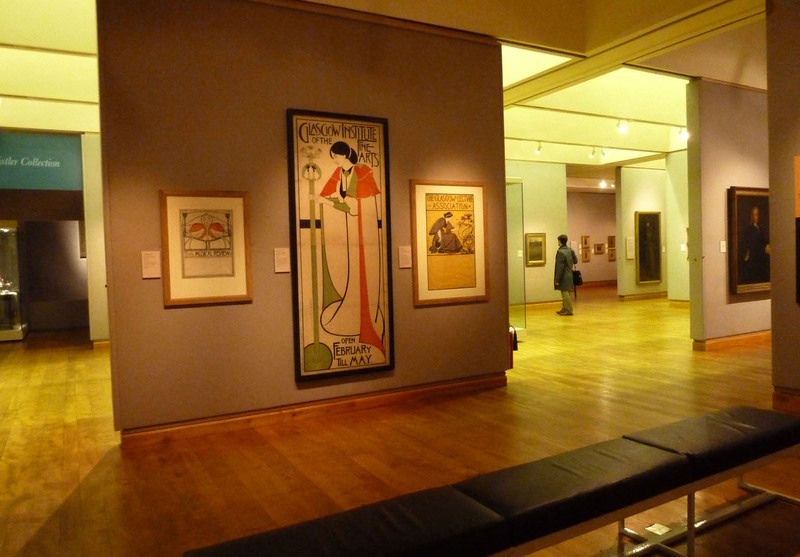 Including works by Mackintosh (of course) and Lautrec’s Jane Avril, which I’ve recently seen at The Courtauld, the posters all successfully combine simplified forms, bold colours and dramatic viewpoints. Posters at the Hunterian Art Gallery. Own photograph. The other aspect was the works by James McNeil Whistler; I had no idea that the University of Glasgow houses one of the world’s pre-eminent collections of Whistler’s works having been bequeathed the entire estate by his heir, Rosalind Birnie Philip. The gallery’s airy layout is perfect for his seascapes; painted ‘en plein air’, these are small-scale, portable panels to which Whistler directly applied paint. The near-abstracted detail is jewel-like. 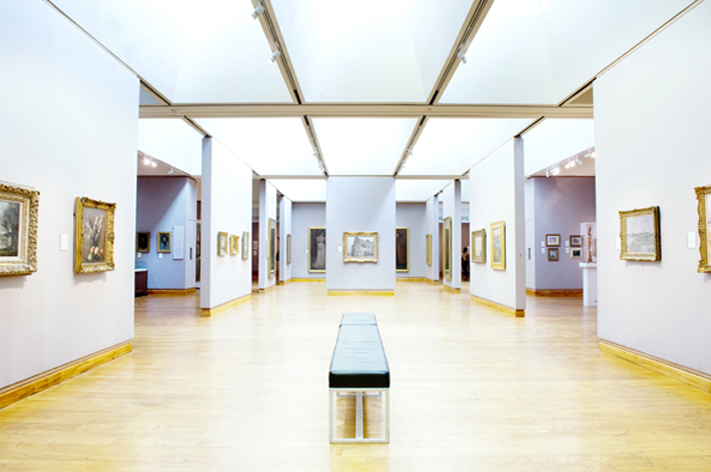 The Hunterian Art Gallery. Image courtesy of The Hunterian, University of Glasgow 2012 and via www.glasgow.ac.uk/hunterian. The other fascinating find was his cartoon for The Fighting Peacocks – a full-size, highly-expressive drawing for the principal mural in the Peacock Room. Pricked for transfer, the work shows Whistler’s retaliation to a quarrel. Having overstepped his brief by decorating the entire room, Frederick Leyland refused to pay beyond the price agreed for the smaller commission. The confrontational peacocks symbolise Whistler as art and Leyland as money, with coins scattered at his feet. James McNeil Whistler, Cartoon of Rich and Poor Peacocks, 1876. Image via www.huntsearch.gla.ac.uk. Thursday evening is late night at GoMA (Glasgow’s Modern Art Gallery) and so I was able to squeeze in another visit before dinner. Downstairs, You, Me, Something Else considers the definition of sculpture today, looking at the progression of sculpture and how it has radically changed over time. 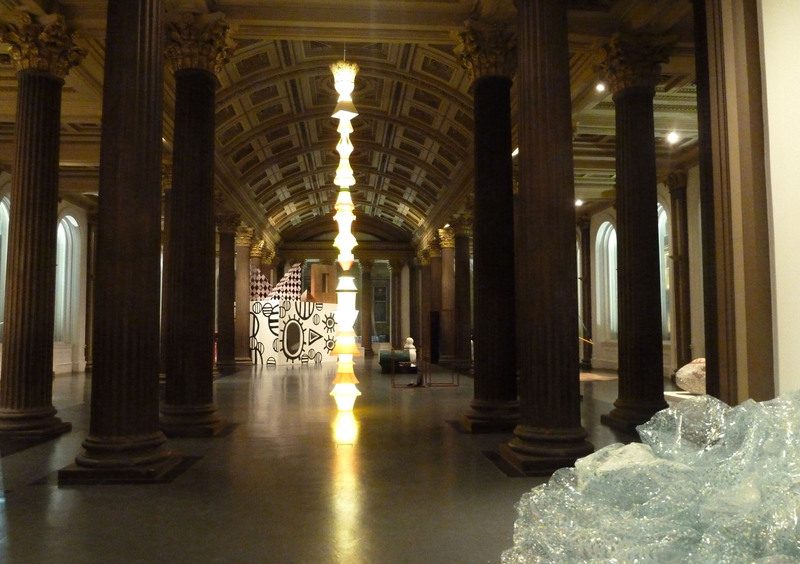 The room is intended to act as a 21st century sculpture court with objects suspended from the ceiling, leaning against columns, lying on the floor or, presented in a more traditional style, on plinths. The media is varied but the artists are united by a common concern for physical experience and material form. Unfortunately (or fortunately if you’re an architectural fan), the architecture dominates much of the works but Andrew Miller’s Shaded, a tower of lampshades and fluorescent lights, stood out for me as the most effective work in this show. You, Me, Something Else at GoMA. Own photograph. After a long day in heels, we were starting to feel tired so took the lift to the top of the gallery and worked our way down. Upstairs is an exhibition celebrating Glasgow Museum’s recent purchases of international contemporary art, understandably prioritising Scottish artists and those who studied at the Glasgow School of Art. 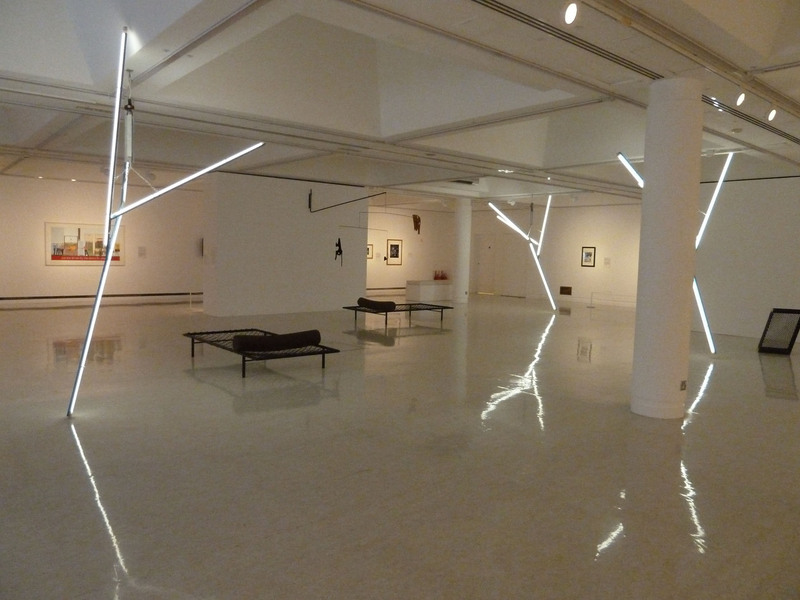 The main piece is a work by Martin Boyce, comprising daybeds, a bin, a wall-mounted mobile, ventilation grills and fluorescent ‘light-trees’, that aims to evoke a cinematic moment in a fictitious night-time urban environment. As always with Boyce, the references are wide-ranging and complex, making you consider the work on many different levels. Martin Boyce, Our Love is Like the Earth, the Sun, the Trees, the Birth, 2003. Own photograph. Continuing down the stairs, we came across Atelier Public, a public artists’ studio to be used by gallery visitors, and an exhibition of works by Alasdair Gray – not really to my taste but he is obviously a talented draughtsman. We were shattered and our bodies had gone into art-overload. After dinner at Stravaigin, we collapsed at Saint Jude’s on Bath Street in our divine penthouse suite, re-energising ourselves in readiness for day two of this Glasgow adventure. All these galleries have a regularly changing exhibition programme: Kelvingrove Art Gallery and Museum and GoMA, www.glasgowlife.org.uk/museums; The Hunterian, http://www.gla.ac.uk/hunterian/.